October has a bad reputation among investors. Partly justified, one might think: in 1987 the FTSE All-Share Index fell 27% in the one month of October, and then in 2008 the index fell 12% in the month. However, a glance at the accompanying chart tells a different story. 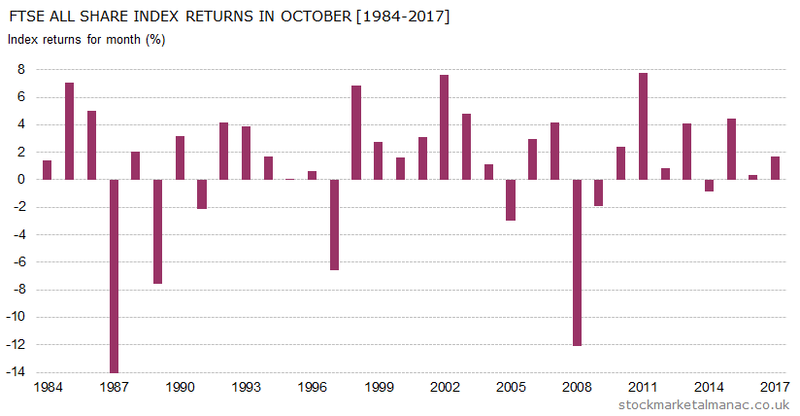 In the 28 years since 1990, the UK stock market has only seen negative returns in October in six years – a record second only to December. And in recent years equities have remained strong in October, only falling in one year since 2010. But, while average equity market returns in October (+1.6% since 1990) may be better than widely believed, the month does have a deserved reputation for volatility. Only September can challenge it for share price fluctuations. In the last ten years, FTSE 350 shares that have the strongest record in October are: BP [BP. ], Hargreaves Lansdown [HL. ], and Booker Group [BOK. By contrast, weak shares in October over the last ten years have been: Marshalls [MSLH], William Hill [WMH], and UDG Healthcare [UDG].